The Pixis is available to order now. Read more reviews on our news pages or via our products pages. 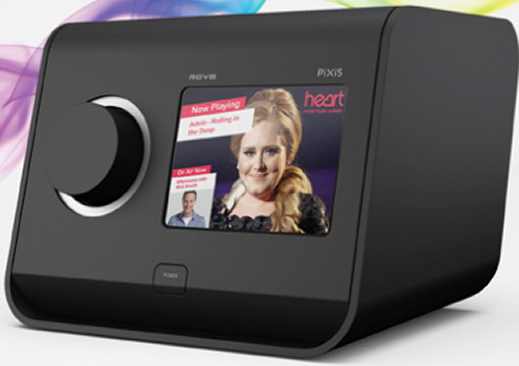 Following 2010's award-winning internet-connected radio AxiS, Revo's brand new radio is aimed at the budget-conscious listener, combining DAB, DAB+ and FM reception with a nifty colour touchscreen. 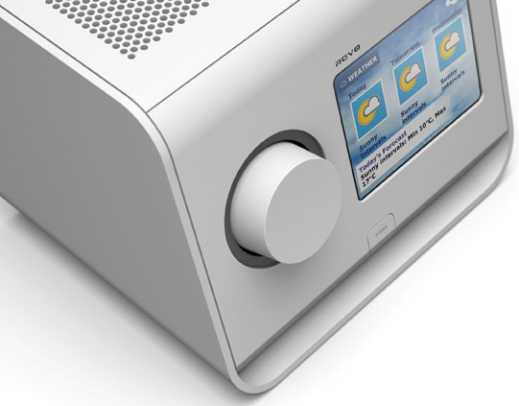 Dispensing dials and buttons for fingers, the AxiS is controllable via its bright 3.5 inch colour touchscreen. Sensibly, there's a traditional volume control for times when you want to answer the 'phone quickly, and a power button, but that's it on the uncluttered fascia. The PiXiS is designed to make the most of DAB slideshows (for the moment it's just Capital FM that's broadcasting slideshow data alongside the audio), but with stations signing up to the technology there'll be useful tidbits of info, like tracklistings, weather reports and travel news for you to glance at. Measuring in at 155mm (W) x 160mm (D) x 125mm (H), the Revo makes an ideal bedside radio, complete with alarm clock functionality, including sleep and snooze functions. There's also a headphone socket and neat telescopic aerial. Favourite stations can be selected right from the screen, with a 2.7 inch full-range speaker and high quality 3 Watt Class D amp for more than enough oomph from such a small stature. The Revo PiXiS breaks the £100 barrier and is available to order direct now, or alternatively from Amazon..